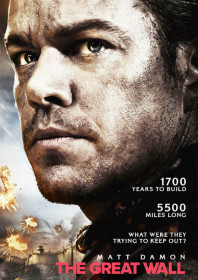 This is an odd choice of film for Matt Damon; a genuine Hollywood A-lister in a CGI-laden cross-cultural creature feature, who seems to have suspended his usual charm and charisma for a stint as a stiff, nondescript western mercenary in Song dynasty China. Along with a fellow European chancer and comic foil – played by Game of Thrones star Pedro Pascal – the duo are taken hostage by a sect of the Imperial army known as the ‘Nameless Order’, and thrown inside the castle-like fortress of the Great Wall of China. The Great Wall is the last line of defence against an onslaught of toothy, lizard-like monsters who descend from the north of the country every 60 years (it’s unclear what they do the rest of the time). The Wall is shown to be versatile, resilient, and far from merely a load of old bricks you can see from space. The landmark embodies a microcosm of China’s military might; a place of innovation (gunpowder is a key motive in the film) and sanctuary for thousands of exquisitely costumed self-sacrificing soldiers. It is depicted as an advanced and adaptable beacon of industry, equipped with hidden rooms, booby traps, giant catapults, primitive hot air balloons, prison cells, general’s quarters and strategic hubs. Damon is an expert archer but he fights for greed and gold – that’s capitalism for you – and through his relations with a plucky female general (played by Jing Tian) he learns to be a little less selfish and instead starts to fight for the common good. Since his excellent wuxia trilogy and the Beijing Olympics opening ceremony, Zhang Yimou has been responsible for providing the vibrant visual backdrop to Beijing’s stringent political messaging. In his first English language feature, he paints the film’s politics in broad strokes, acknowledging the need for compromise in negotiations with the west. He also aptly shows why he is so accomplished at meticulously structured action set-pieces, building computer-generated battle scenes of biblical proportions (it’s a film which seems worthy of its 3D presentation). As a direct consequence, however, there seems to be very little room left for character, plot, or subtlety. The whole thing feels strangely removed and weightless, with precious little to keep viewers emotionally connected to the huge spectacle.